It’s time to announce the winner of the Silver Hills Giveaway, who will be receiving 5 coupons for free Silver Hills bread, and a cute t-shirt! 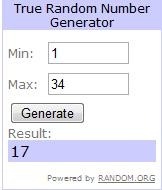 I’ve tabulated the entries, and consulted good ol’ Random.org to select our winner. Lucky entry #17 – Emily from Pursuit of Heathfulness! I’ve haven’t had this type of bread yet, but I absolutely love anything nutty/grain filled. Sounds like the squirrel bread is right up my alley! Looks like you’ll be getting that chance to try out some Squirrelly bread Emily. Email me with your mailing information, and I will pass it on to Silver Hills asap. Thanks to everyone who entered. And remember, you can get a free coupon yourselves just by completing this short survey. okay i didnt win, but thank you for the cupon link.. it eases the pain just a bit hehe. congrats emily!